William and Edward Fell founded the town of Fell’s Point around 1763 and turned it into a shipbuilding and commercial center—today it’s a popular dining and people-watching destination that you can reach by car or water taxi! This hat is 100% Fells Point, from brim to tip. When I contacted Joelle, dyer behind Wandering Wool, about this project, I told her it was inspired by a rainy day in Fells and she sent me the absolute perfect colorway, Moriarty. Its mix of dark blues and grays is an ideal match for the staggered garter stitch cobblestones along the brim and eyelet raindrops decorating the body. As an added bonus, this hat can be worn with either side facing out—2 hats in one! 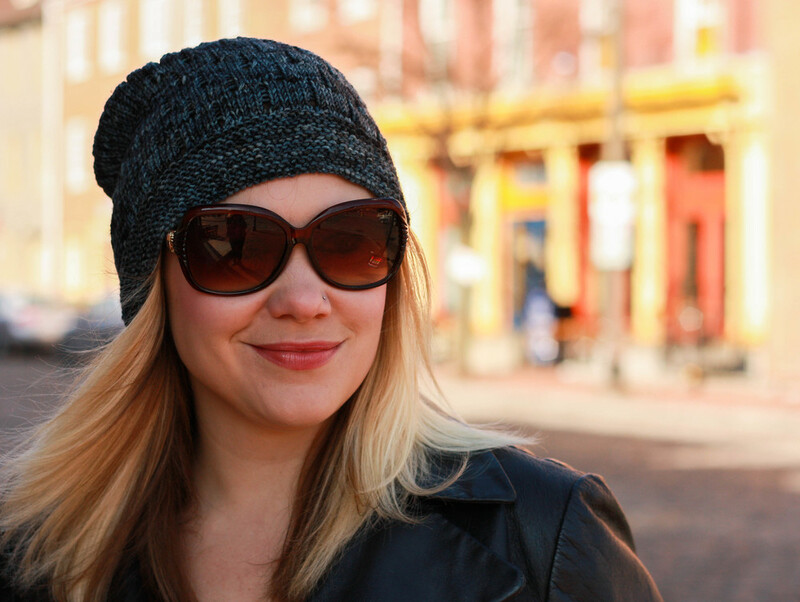 This pattern is part of the Charm City Knits collection. Yarn: Wandering Wool Shenandoah, 100% superwash merino wool, 274 yd/100 g: 1 skein. Sample shown is size M, in colorway Moriarty.